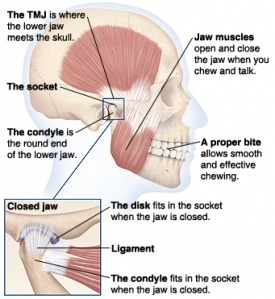 There is a lot of confusion when people speak about TMJ. Everyone has a TMJ which stands for Temporomandibular joint. This is the joint between the mandibular and the temporal bone. TMD is when there is a dysfunction of the Temporomandibular joint (TMJ). There are a number of muscles which attach to and surround this joint and which are involved in mastication (i.e. chewing) as well as other facial movements involving the jaw. Some of the major structures which are often involved are the highly complex disc , and four jaw muscles, on the side of the head (the temporalis ), on the side of the jaw (the masseter ), both of which are jaw closers. Biters. The other two muscles lie deep in the jaw (the pterygoids ). Excessive chronic tension in the muscles connected with and surrounding the TMJ can cause not only local pain perception in the area of the jaw itself, but can also set-up pain referral patterns (through trigger points) causing regular experiences of headaches, migraines, involuntary teeth grinding (bruxism), gum or tooth related pain and even tiniuts (ringing in the ears). Muscular tension or shortening in the muscle fibres resulting in restricted range of movement of the jaw joint can also cause pain and even a limited opening movement of the mouth itself (e.g. trismus). TMD is treatable depending on the diagnosis. You should get back to your active lifestyle without the constant pain. A effective method of treatment has been found to be internal massage and A.R.T of the muscles of mastication combined with ultrasound, heat and cryotherapy. We will also show you exercises and stretches for you to do.